5 Pointz have a large cult following of die hard sneaker heads. They have a massed this following over years of delivering quality drops of the most relevant and current sneakers worldwide. 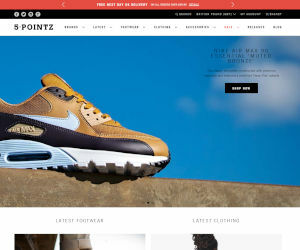 5 Pointz sell some of the most prestigious brands in the world, including Adidas, Air Jordan and 10 Deep. They sell dominantly footwear for the street but they also have a large collection of popular clothing from the likes of Carhartt. 5 Pointz have regular voucher codes available and we will ensure we have the latest ones ready for you. We often get asked exactly where you can add a voucher code to an order at 5 Pointz. That is why we have produced this video to show you exactly how to do it.